If you’ve worked long enough or studied hard enough, you’re an expert. However, does that mean you have the ability to lead, motivate and effectively deliver your message from an influential platform? Not necessarily. Simply put, people seek your advice, mentorship and guidance because you have set yourself apart as a thought leader, innovator and communicator. Become a Thought Leader and have Customers Come to You! Thought Leader Life is about how to become a thought leader, what it is like to be a thought leader, how to make thought leaders, what thought leadership means and tips for thought leaders from thought leaders. 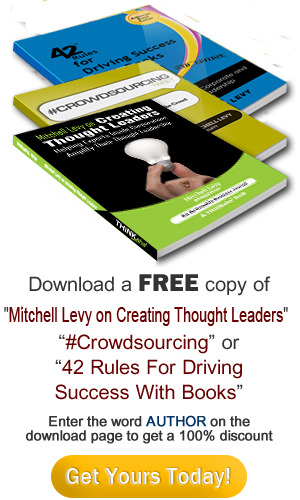 For more information on Thought Leader Life with Mitchell Levy, Click here! AHAthat makes is easy to SHARE, AUTHOR & PROMOTE you. As the first AHAleadership (Thought Leadership) platform on the market, it allows you to 1) Easily build your brand by sharing others’ quotes with proper attribution and 2) Show your expertise by creating your book in 8-10 hours and having others share your quotes. There are over 30k quotes from recognized AHAleaders that you can share in seconds for free. All content on the platform is curated by THiNKaha which has published over 800 physical and eBooks. For more information on AHAthat, Click here!